After my previous article Example of mail generation (MSGParser, Apache POI-HSMF) concerning the generation of a mail file on server side, I would expose you an example of XLS (Excel) generation by using the Apache POI. The Apache POI Project’s mission is to create and maintain Java APIs for manipulating various file formats based upon the Office Open XML standards (OOXML) and Microsoft’s OLE 2 Compound Document format (OLE2). In short, you can read and write MS Excel files using Java. The Apache POI project is celebrating its 10th anniversary. Copyright (c) 2000-2003, BEA Systems, <http://www.bea.com/>. the java standard class (FileWriter), but for the second format, we use the Apache library POI.
! %-10.10r - Example. Left-justify time elapsed within 10-wide filed.
! Truncate from beginning if wider than 10 characters. Create a POJO class named DvdEntity in the new package com.ho.apache.poi.test. This class will contain the objects to export. * Entity containing the Dvd object. – Create a new class named NullSafeCSVFileWriter extending java.io.FileWriter which is a NUllSave implementation of FileWriter in order to calling write with a null argument won’t throw any exception, but nothing will be written. This class also provides utility methods to write Calendar, formated as timestamp, time, date, according to the DateFormats provided when creating the instance. Same goes for Double / Integer values. – Create a new class named DvdCSVExporter in the package com.ho.apache.poi.test which provides utility methods specific to our example (write headers, write Dvd entity,..) by using the previous class NullSafeCSVFileWriter. 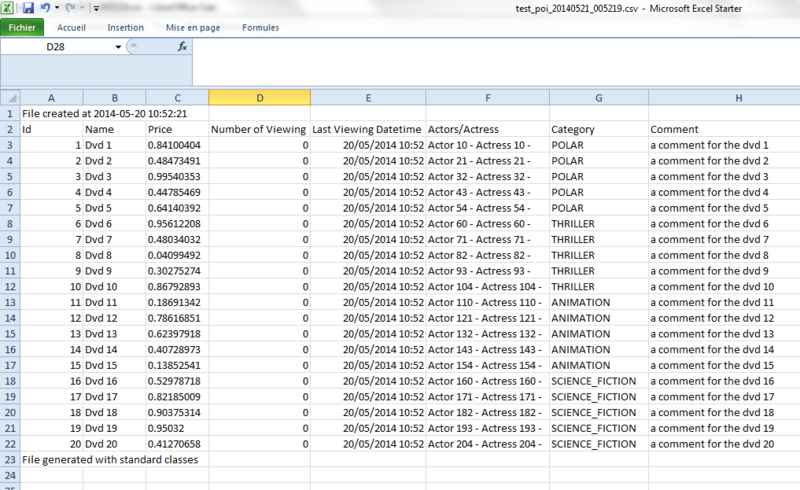 So, this class handles the generation of the CSV file via private methods to write headers and dvd entity. * Exports the list of entities into the specified file. * Write the headers in the CSV file. – Create new interface IXLSFileBuilder provides utility methods to write headers, Calendar, formatted as timestamp, time, date to an excel file. * (before, after or both). * Set value at the given column, for the current row of data. * @param value : Value to store. * Change the current row of data. – Create a new class XLSFileBuilder implementing previous interface IXLSFileBuilder. This class is the heart class of using Apache POI in order to create new sheet, add headers, add new row, set values in cell, set style to cell…etc. * Constructs a new excel file builder, adding automatically a new sheet. * and truncated if necessary (max length = 31 characters). – Create a new class named DvdXLSExporter in the package com.ho.apache.poi.test which provides utility methods specific to our example (write headers, write Dvd entity,..) by using the previous class XLSFileBuilder. 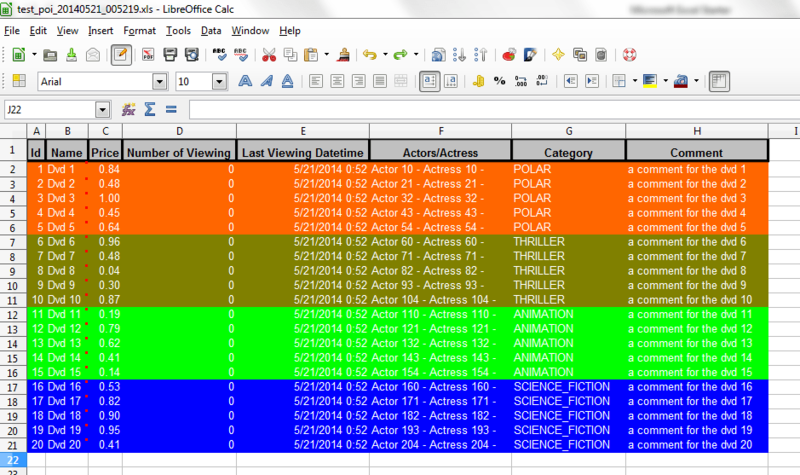 So, this class handles the generation of the XLS file via private methods to write headers and dvd entity. 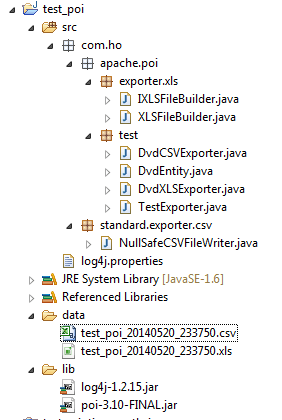 Finally, create a new class named TestExporter in the package com.ho.apache.poi.test containing the main method to launch the DvdCSVExporter and DvdXLSExporter in order to create the files CSV and XLS of DVD entities. // Parse parameters, load properties and mark the batch as started.